Home/SEO/How SEO has changed over years and how it is still alive and kicking! There are various people who say that SEO is dead but these are nothing but provocative announcements. 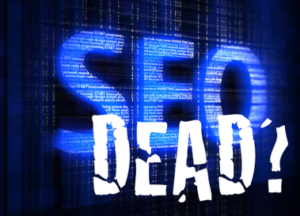 SEO can never be dead but the way you’re practicing it on your website might be dead. You have probably optimized your meta tags and H1s and you have also built a few links and now you think you can sit back and just watch your website rise high above the ladder of search engine rankings. Wrong! You can never achieve success with such cookie-cutter approach towards SEO as this will hardly work in today’s SEO landscape. We humans always look for a formula which can be repeated to obtain a goal. But unfortunately there’s no such formula to SEO anylonger. There are definitely some best practices and a skilled practitioner of SEO can increase the chances of good outcome. But this is a world of no guarantees, as long as SEO is concerned. In fact you should steer clear from anyone who tells you that there is a precise SEO approach that will work. Hence there are many optimizers who have operated under the illusion that changing the title tags a little more and also another link would be rewarding enough. Does this mean that the pundits are right when they claim that SEO is dead? Well, conventional SEO is almost dead and outsmarting the search engines is no longer possible. If you remember how Panda update shook the world of SEO, you would also know that Panda was the introduction to machine learning for many in the industry. The engineers soon started applying machine learning algorithms to extend the human opinions to the rest of the web. Then in September, 2013 came artificial intelligence at the next level by the introduction of the Hummingbird update. Most us have by then come to terms with the spammy link penalization counterpart Penguin which stares back at us in Google Analytics in the form of major drop in organic traffic. Now Google offers us a Star Trekkian future where we speak to our machines using everyday natural language and they answer us back. But Google required understanding the intent of the query and not only the words used in it. This ability to understand the words being used in the query is due to artificial intelligence. Therefore, we can easily claim that SEO is definitely not dead but the ways of doing SEO has certainly changed.